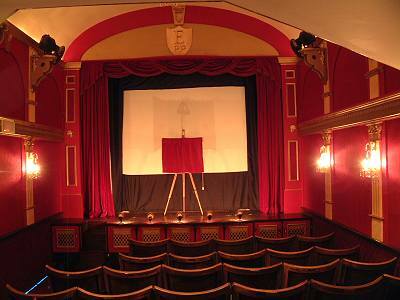 Southwold's brand new, 1912 style, cinema! The facade of the Electric Picture Palace, designed by John Bennett to reflect the styles of 1912, is a far cry from the cart shed and hayloft that previously stood here until 2000. The first Southwold Cinema opened in 1912 in York Road - a very short distance away - and was also called The Electric Picture Palace. 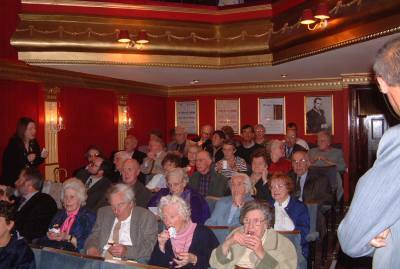 The Southwold Film Society have been enthusiastically showing films since 1998. 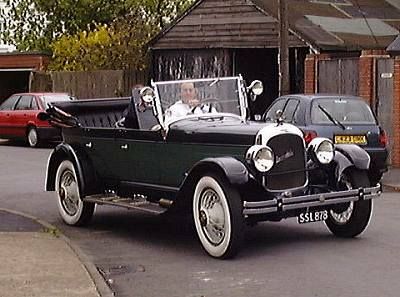 This 1925 Locomobile (one of only 25 built) was loaned by a member of the Southwold Film Society to provide a period ambience to the opening ceremony and to be a platform for the speakers. The local community, fired by John Bennett's enthusiasm, have taken this project to their hearts and have raised over £100,000 to buy the property and convert it to the cinema we see today. Additionally many people have given their time and skills to work on the project. 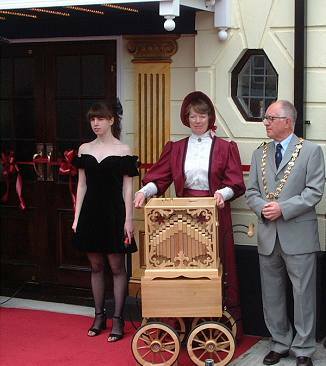 The crowds started to gather well before the opening at 3pm and Maureen Churchill (centre) entertained everyone for an hour with her beautiful table organ. The Mayor of Southwold, John Miller, is seen here (right) awaiting the arrival of Michael Palin. Rosie Bennett, John's daughter, stands to the left. Several short speeches were delivered from the 1925 Locomobile including a short prayer and blessing from Reverend Jane Wilson the vicar of Southwold. John Bennett spoke of the history of Cinema in Southwold from 1912, the formation of the Film Society in 1998 and the work done since 2000 to build this new cinema. 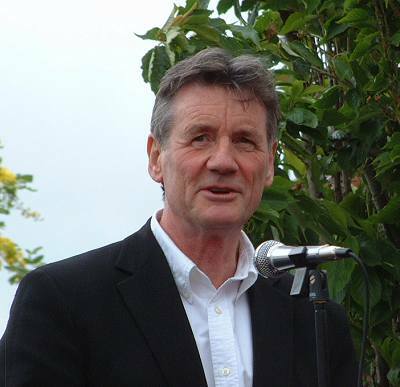 John Miller, the Town Mayor, then introduced Michael Palin. 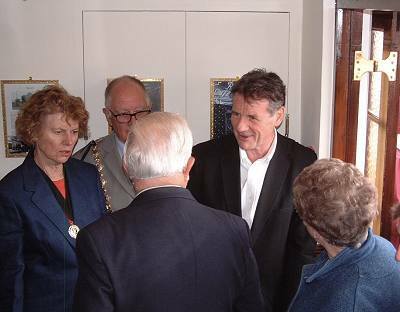 Michael Palin spoke of his fond memories of Southwold, his memories of the old cinema which he used to visit with his girlfriend, Helen, (now his wife and with him today). He met his wife here in Southwold and his film "East of Ipswich" was based around his childhood memories of the town. He welcomed the new cinema to Southwold saying that it would be very welcome after a 40 year absence and he commended it as a focus for interest in films and film making. 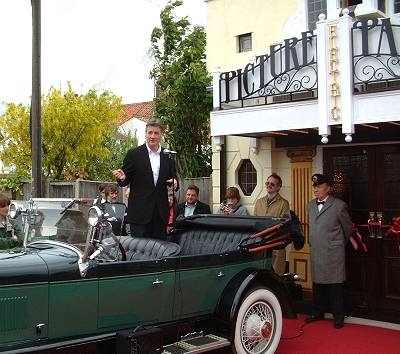 After opening the Electric Picture Palace by cutting the ribbon Michael Palin stood in the foyer and chatted to the invited guests attending the inaugral showing of the "Smallest Show on Earth". The guests were all sponsors or supporters of the project and my wife and I were honoured to be included in their numbers. Blythweb Ltd are very proud to have sponsored the Kiosk. 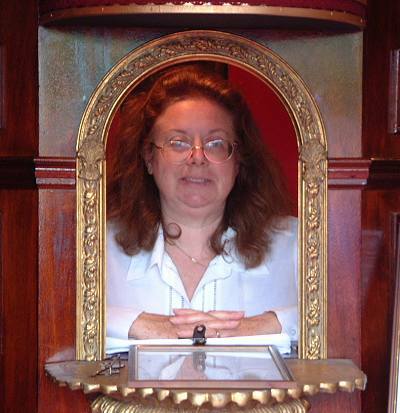 Jane Bennett looks after the box office. 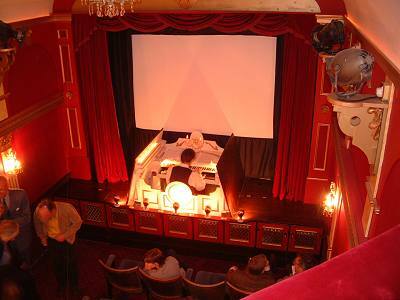 The whole cinema which seats just 66 people is delightfully bijou. 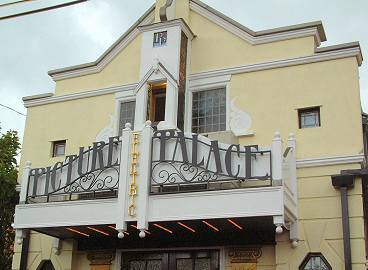 However it is a tribute to John Bennett's architectural skill that the cinema is indeed a "palace" and enjoys every comfort albeit on a small scale. There are well appointed facilities upstairs and down, there are hot drinks available in the interval - there is even a "tiny wurlitzer" but more of that below! This auditorium maybe small but it is not lacking in detail. The intention was to recreate the heyday of the cinema and every effort has been made to reproduce the pleasure of visiting the cinema so often overlooked by the big multiplexes. There is a supporting picture as well as the main attraction at every show, the "tiny wurlitzer" rises from below the stage and plays during the interval. There is even a commissionaire on hand to assist cinema goers as they arrive and depart! This photo was taken just before the opening and the easel holds the memorial plaque for Michael Palin to unveil. 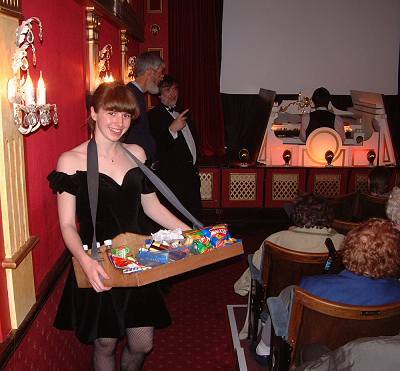 During the interval of the film the audience tucked in to their ice creams - dispensed by Rosie Bennett . It is hard to believe how much has been achieved here in a relatively short time. The Southwold Film Society became a charity in 2000, anyone over 16 can join the Society and it now has over 370 members. The showing of the "Smallest Show on Earth" was the first matinee the Society had ever staged! Rosie Bennett serves the traditional interval refreshments. In the background Nathan plays the "tiny wurlitzer". It really is a step back in time and much of the appeal of the Electric Picture Palace (for me certainly) is this recreation of the sheer pleasure of "going to the cinema". It is perhaps appropriate that it should be here in Southwold which so celebrates the way we used to enjoy ourselves. As soon as the flickering image on the screen fades the organist rises majestically through the floor of the stage playing as he goes. The electronic organ sounds every bit as good as the original and is expertly played by Nathan. The organ pit is reached by a tunnel from the foyer dug especially for the purpose. Thus the organist can take up his place at the organ just before the interval and remain with his organ as it sinks below the stage when the film begins again. To the Electric Picture Palace, Southwold. May your screen bring joy and your organ continue to rise! 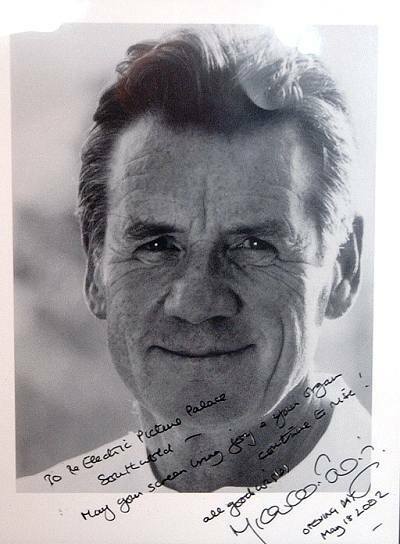 All good wishes Michael Palin. Opening Day May 18 2002. Michael spent a lot of time talking to people and signed a myriad of autographs. He and his wife stayed for the first half of the film and departed after the interval.